Panel from The White Ribbon Alliance for Safe Motherhood Burkina Faso, Section Kadiogo. Click to view full image. In 2013, MOS@N, an experimental mobile health (mHealth) network providing medical monitoring and follow-up of pregnant women, was launched in the health district of Nouna in rural Burkina Faso. 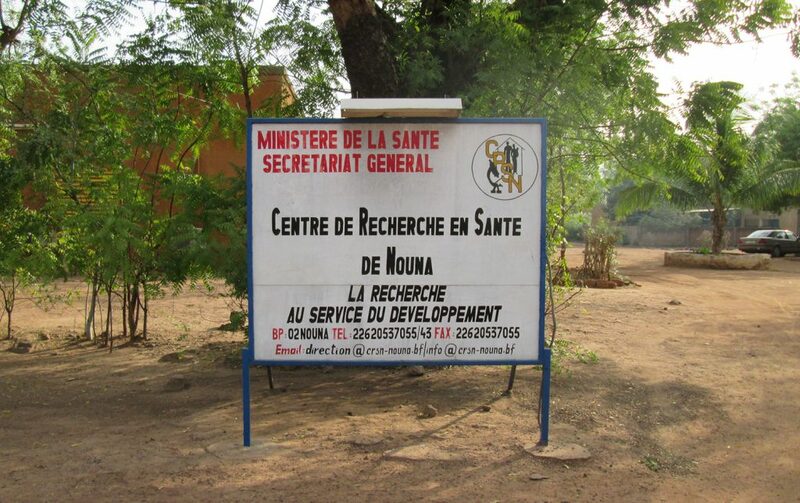 MOS@N is implemented by the Centre de Recherche en Santé de Nouna (CRSN), a national health research center. It is funded by Canada’s International Development Research Centre (IDRC) and supported by the Ministry of Health. MOS@N operates in an area where maternal mortality remains a major public health challenge, and where the rates of antenatal care consultation (ANC) attendance and of assisted delivery are relatively low. It aims to pilot the use of mobile devices to improve the use of health care services by pregnant women. MOS@N sends voice medical appointment reminders and health advice to “godmothers,” community relays selected as part of the project to follow up with pregnant women in their respective villages. 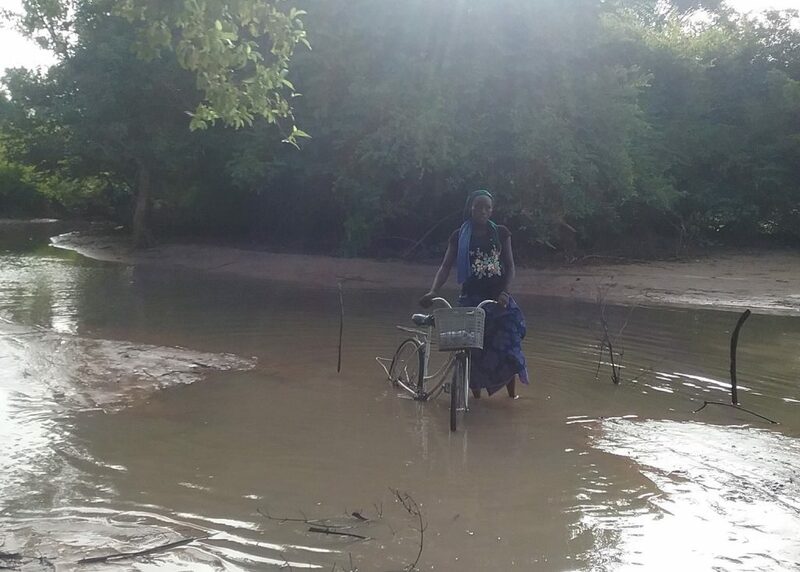 To do so, godmothers were provided with a mobile phone and a bicycle to facilitate their movement within the village as they travel to the local primary health care center (PHC). The cell phone has prerecorded health education messages for godmothers to play when convening maternal health awareness sessions. Equipped with phones and data connectivity, godmothers can reach remote populations to provide them with health advice and information. MOS@N also includes an electronic health record system that runs on computers installed for that purpose at local PHCs. Since none of the local PHCs are connected to the electricity grid, they were also provided solar panels to keep the computers running. Health workers—nurses and midwives—at PHCs are in charge of entering patient data into the system, which then automatically generates the reminders sent to the godmothers’ phones. In 26 villages, served by five different PHCs, MOS@N brings together pregnant women, godmothers, rural PHCs, health workers, technicians, public health researchers, server rooms, an automatic callback system, bicycles, computers, portable solar panels, batteries, cell phones and refill cards, not to mention husbands, dirt roads, bicycle repair stations, heavy rains, and village authorities, in an experimental network. Fig. 1. The entrance of the CRSN. Photo by author. The number of mHealth projects and systems implemented in low- and middle-income countries has doubled in the past five years. Driven by the leadership of the World Health Organization (WHO), global health organizations, researchers, and donors increasingly expect data connectivity to strengthen health systems, reduce costs for access to health care, and thus contribute to health equity. Connectivity promises to bring new bodies and populations into sight, alleviating suffering and saving lives; any obstacle to the flow of information is increasingly the cause of suffering and loss of life. In Burkina Faso too, mHealth networks are multiplying. Most initiatives are aimed at making the national health system more data driven, with a strong emphasis on maternal and child health. In the wake of the Ebola virus epidemic in West Africa, initiatives aimed at digitizing public health surveillance and outbreak response management have also been on the rise. Organizations involved in the funding, design, and deployment of mHealth in Burkina Faso include the Centre Muraz, Terre des Hommes, WHO, Bill & Melinda Gates Foundation, UNICEF, and Grand Challenges Canada. Notable projects include the Integrated eDiagnostic Approach (IeDA), which uses mHealth devices to provide diagnostic support to health care workers and to collect data made available to public health decision makers. Another example is the integration of the WHO-sponsored Maternal Death Surveillance and Response (MDSR) into the national disease surveillance system, requiring health workers to immediately report cases of maternal death via mobile phones. The Burkina Faso Ministry of Health has been supportive of these developments, and it has recently adopted a nationwide strategy to integrate digital technologies into the national health system. Access. Information and communication technologies (ICTs) suggest the projects have the potential to make health systems more equitable through better access to health care and information. IDRC takes up a popular theme within mHealth literature: mobile devices are expected to strengthen equity by reducing disparities related to cost, distance, and inadequate health infrastructure (Mehl and Labrique 2014:184). They are expected to enable relatively transparent, seamless communication, thus facilitating the provision of health services to previously underserved populations. Operational knowledge. IDRC-supported projects should contribute in bridging the gap between research and implementation. Exemplifying the rising popularity of operational research (or operations research) in global health, projects were expected to generate evidence for decision making by studying the process of implementation itself rather than focusing only on health outcomes. IDRC’s call thus insisted that selected projects should examine how ICTs were being integrated into resource-constrained settings by paying attention to the local usage and adoption of mobile technology. Although IDRC’s call was premised on the notion that connectivity should improve access to health care, it aimed to find out what “works” and what does not in various contexts. Replicability. IDRC’s call directly responded to the lack of evidence in the literature about the scaling of mHealth initiatives into health systems. The vast majority of mHealth interventions are indeed only pilot projects, and remain so. Proposals selected by IDRC were to pay particular attention to the potential for scalability or replicability. As I suggest, MOS@N indeed raises the problem of scale: How can its implementation process be replicated so that connectivity produces similar effects in different settings? The other day, when I was accompanying a pregnant woman, we started walking but we did not reach the Bagala PHC on time so she delivered on the road. 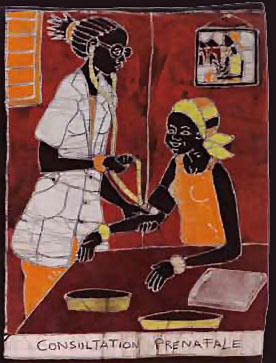 I called the nurse at the Sikoro PHC [to which the godmother would normally take women of her village, except during the rainy season] to let her know that one of my women had just delivered on the road. I then brought her to Bagala but the nurse refused to see her. She kept asking why she delivered at home. I explained that we really were on the road to come here, and that the umbilical cord was not cut yet and her clothes were soiled with blood. But she reprimanded us, so we left. I gave my phone to her husband who then called the Sikoro nurse to let her know. In the end we brought her back home to cut the umbilical cord ourselves. The mobility of data, which MOS@N aims to facilitate, in fact still entails the mobility of devices and bodies. And it entails significant expenditure. First, there is physical labor. MOS@N generates displacement, especially for godmothers. Although they were provided with a bicycle to facilitate their travels, the role of godmothers has gradually evolved to include the accompaniment to PHCs. 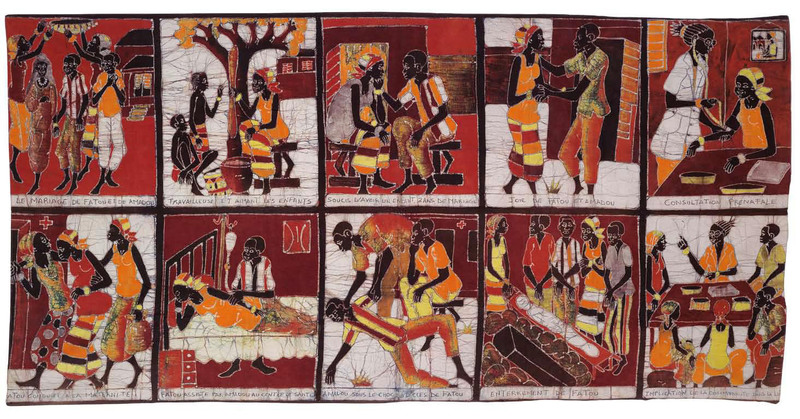 As the story above shows, godmothers now walk and ride along with pregnant women. They also assist health workers during deliveries. This new role was improvised in response to the technical difficulties in generating automatic voice reminders. Indeed, as a result of many of the challenges listed above, godmothers generally do not receive the automatic reminders on time, if at all, as was initially planned. Therefore, they may spend hours on the road every day depending on where they live. Fig. 2. Adverse Road Conditions. Photo by DAKISSAGA Judion. Mobility in MOS@N also comes with material and energy expenditure. Batteries, cell phones, and portable solar panels are often recharged, disposed of, and replaced. Bicycles are repaired and replaced. Bandwidth is consumed. Project managers move across the district, not to mention donors, researchers, and other visitors traveling to Nouna. MOS@N also comes with a significant increase in workload for health workers, who have to enter patient data into the computer after each consultation, not to mention the tireless work of MOS@N’s field manager, logisticians, technicians, and supervisors. Improved access to health care and information in MOS@N has little to do with an easy circulation—of devices, godmothers, and messages—enabled by a stable, underlying network infrastructure. MOS@N foregrounds the corporeal and material demands of media mobility. Little devices apparently carry more than their own weight. “Knowledge is like light. Weightless and intangible, it can easily travel the world, enlightening the lives of people everywhere” (World Bank 1999:1). It is with these words that a flagship World Development Report on knowledge for development began before emphasizing that millions of children die because of their parents’ lack of access to knowledge. Since the report was published almost two decades ago, mHealth devices have come to embody better than any other technology the medium promising such a life-saving access to knowledge. As such, they display a strong capacity to enchant and mobilize affect (Harvey and Knox 2012; Larkin 2013). The affective power of mHealth devices is directly related to their technical qualities, including their compact size and portability. Although the hype surrounding mHealth has lessened in recent years—a situation acknowledged by IDRC’s insistence on the need to determine what “works” and what does not—the underlying vision of mobile devices as fluid, neutral conduits for the flow of information remains largely unchallenged (Duclos, 2016). In contrast to this understanding of media devices, ethnographic material on MOS@N points to a conception of media as messy, unpredictable, and transformational. In MOS@N, media devices not only carry symbols and meanings but actually shape connections and transform who/what is connected. This is partly due to the expenditures that come with failing data connectivity, resulting in godmothers still using their phones but now also walking with pregnant women to monitor their attendance to ANCs. Although we are left speculating about the effects of reliable automatic reminders, what is certain is that MOS@N alters individual and collective existence in Nouna in far-reaching ways. Godmothers are extremely useful because here at the PHC, we do not know people in the community. Because they live in the villages, they have become our mouths and our ears with the population. …I’m a stranger here, but they know everyone. Who else could get them to participate in our activities? Now, all we have to do is call them [the godmothers]. In a sense, godmothers, not mobile phones, are MOS@N’s primary mediating devices. Godmothers of course are not passive conduits, and their work of mediation may have unforeseen effects. They spend considerable time with midwives and nurses, gaining practical knowledge and experience, but also experiencing conflicts and performing tasks not designed as part of MOS@N. Godmothers have assisted women delivering on their way to the PHC, stayed several nights at the PHC, cleaned up the PHC, and have mobilized local women as part of mass vaccination campaigns. Some have lent their phone to their children so that they could listen to music, sometimes never to see it back in working order. Others have forgotten to deliver messages, or delivered them late, or to the wrong person. Overall, though, godmothers and their phones have been described as a reassuring presence. MOS@N has also had a significant impact on the organization of community life in Nouna. Cell phone ownership, accompaniment, and health education sessions have brought godmothers considerable social recognition. It has changed the way they are perceived. Neighbors, family members, and children borrow their phones. Some are called “doctors,” or are given small presents. In some cases, the role of godmother has come with emotional hardship. Their husbands sometimes frown upon their ownership of mobile phones. Resentment from fellow villagers is also common. Godmothers can, for instance, be accused of spreading rumors, or of deception. The confidential nature of pregnancy, the age of godmothers (in some cases younger than the women they follow), jealousy over the choice of the godmother (and her stipend and equipment), or health complications may all contribute in causing tension, and in one case even leading to the banishment of a godmother and her family from their village. In general, though, when speaking of MOS@N godmothers express sentiments of satisfaction, excitement, and deep pride. Being a godmother arguably comes with a new orientation to others and to the world. At the time of writing, funding had run out and MOS@N had come to an end. MOS@N was designed and deployed as a pilot project. As mentioned earlier, MOS@N had to improve access to health care and information to be considered successful. To a large extent, MOS@N has done just that. In addition to creating unexpected relationships, MOS@N has generated measurable public health outcomes showing significant improvement in antenatal attendance and assisted delivery rates in participating villages. MOS@N was also expected to generate data for global health donors/funders/policymakers, particularly about how it achieved this outcome, and how this process could be scaled. This is where success became harder to measure. How could MOS@N lead to something else? Can it be replicated and, if so, under what conditions? As discussed earlier, the mobility of data in MOS@N came at a heavy cost, whether it was in terms of physical labor, or material and energy expenditure. MOS@N depends on a persistent and demanding care for the relations that constitute it as media-world. In a related manner, MOS@N relied on a high degree of improvisation, or what could be considered an “experimental” ethos. It is important to emphasize that researchers at the CRSN were aware that MOS@N remained largely experimental. Although this was their first mHealth project, they knew, because they had worked closely with local communities in the past decade, that the demands placed upon mHealth within these communities might differ from their own. MOS@N involved qualitative research aimed at exploring these demands, at examining the project’s effect, and at fine-tuning it along the way. In other words, researchers at the CRSN were aware of what they did not know, which is the problem: now that they are looking for funding to scale the network, there is still much they do not know. They have gained implementation skills, but can they trust that “more of the same” will lead to future success when the “same” is in itself contingent and unpredictable? To what extent does the experimental ethos guiding MOS@N’s implementation lend itself to formalization? What if the way MOS@N succeeded does not suggest easy replicability? After all, MOS@N does deflate any expectation that mHealth networks can be extended in a parsimonious, predictable manner. CRSN researchers did pay close attention to the processes that breathe life into MOS@N and make it work, thus at least partially meeting IDRC’s expectation for operational knowledge. But rendering processes visible does not suddenly make these processes amenable to prediction. The future of MOS@N faces a conundrum critical to the deployment of little development devices in general: only out of fragile, messy connections do consistencies appear to emerge. This paper is the result of a collaboration with the Centre de Recherche en Santé de Nouna (CRSN). I would like to thank Ali Sié, Maurice Yé, Gilles Bibeau, Hamidou Sanou, Moubassira Kagoné and Hélène Sawadogo for introducing me to the CRSN, and for their work which is critical to this research. I also thank the editors of this collection for their genuine comments. Duclos, V. 2016. The map and the territory: An ethnographic study of the low utilisation of a global eHealth network. Journal of Information Technology 31(4):334–346. Harvey, P., and H. Knox. 2012. The Enchantments of Infrastructure. Mobilities 7(4):521–536. Larkin, B. 2013. The Politics and Poetics of Infrastructure. Annual Review of Anthropology 42(1):327–343. Mehl, G., and A. Labrique. 2014. Prioritizing integrated mHealth strategies for universal health coverage. Science 345(6202):1284–1287. World Bank. 1999. World Development Report 1998/99: Knowledge for Development. New York, NY: Oxford University Press.